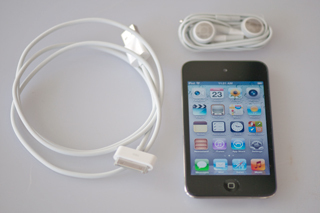 I won this iPod (different from the iPad) touch 8GB in an Agilent contest related to bench top power supplies. I was about to sell it new in the unopened box when I found out that it works with my home WiFi network. And does not require a cell phone account. Comes with a USB cable and ear buds. This is a 4th generation 8 GB iPod touch model: MC540LL. It arrived loaded with OS 5.01 but the home page screen said that OS 5.1 was available and it included the ability to link to an HD TV. 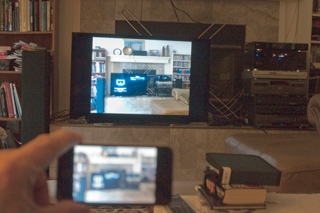 Since I've got a very nice WiFi enabled TV and 7.1 sound home theater system I'd like to do this. But pressing the update now button did nothing. Apple support said I needed to load the current iTunes software on my PC, which was done. Connecting the iPod to USB cable to my PC started iTurns, but I could see no provision to do the software update. After turning off iTunes I was able to make the update to 5.1 (with the USB cable connected to the PC) by pressing "update now" on the iPod. If you hold your finger on one of the icons for a number of seconds, all the icons will start wiggling. This is the indication that you can now move an icon to a new location or if it has a red "X" you can delete it. To stop the wiggling just press the home button. So far I haven't got this to work. Can enter a URL, but pressing GO on the keyboard screen has no effect. I tried entering the URL as PRC68.com and www.PRC68.com and http://www.PRC68.com all the time spelling out dot C O M as individual letters and when GO was pressed nothing happened. It's possible by tapping on the top bar to open another bar that contains a Google search engine on the right. Entering PRC68 in the search engine then searching brought up a Google search results page with PRC68.com as the first result. Clicking on that link opened my PRC68.com web page. After this Safari worked when a URL was manually entered, so there's some type of initialization bug in OS5.1. I've enabled larger type and screen magnification (double tap with 3 fingers, scroll with 3 fingers) that way I can use the iPod. The squeeze and spread gestures with the thumb and index finger work. There are cameras pointing to the back and front that can be configured either for still or HD video recording. It remains to be seen if the video will work in portrait mode. So far I haven't found a way to get a video out of the iPod if it's more than 100 G Bytes. Apple support has suggested buying iMovie and splitting it into smaller scenes that could then be stitched back together on a computer. Took still photo using iPod then using the Photos app selected that photo. then on the pop-up menu selected AirPlay instead of iPod. Note I can do this three rooms away because the house Wi-Fi is carrying the signal. This is a hardware device that connects to my HD TV using an HDMI cable (and maybe a TOS fiber optic audio cable). 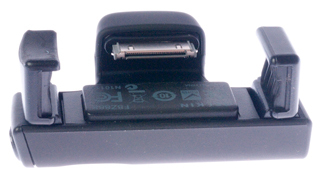 It allows the iPod to make a wireless connection to the TV. Note my TV now has WiFi connectivity and I watch Netflix streaming using it or using the WiFi connection on the Blu-ray player, but there's some Apple proprietary aspect to this so you need the Apple TV hardware. One of the features is the ability to view .tif still images, which my neither the TV nor Blu-ray player now support. Maybe (but probably not) there will be support for 16 bit tif still images and hepfully a future upgrade will support DNG (Digital NeGative) still images that are equivalent to the RAW files like NEF that have 16 bits per color rather than the 8 bits per color supported by .jpg images. This all relates to high quality still images. OS5.1 supports some neat interaction between the HD TV and the iPod. On order 23 March 2012 & should be here in a week or so. More to come. The AppleTV needs to be configured using a networked computer running iTunes and using the hardware remote both to your AppleID and the network ID and password. Then when in the movies app on AppleTV you have the option of paying for a movie using your Apple store account. This is the main menu for Apple TV (March 2012). One of the key apps for me is the Lower Left Photo Stream. Before you can use it you need to select what files to allow using iTunes on a network connected computer. a large flat file since only a thumbnial image is shows and the data of the selected photo is shown, NOT it's file name. Note: After turning on the TV and Surround Sound audio boxes (Home Theater) and selecting the HDMI-1 input nothing will happen because the AppleTV turns off after some time delay. But when you select a still or video to view on the iPod or in iTunes, then the AppleTV automatically turns on and it's image is displayed. My iPod is the smallest memory model ( 8GB) and I just drove to the post office with it on in video mode. More than 17 minutes was recorded. In iPod Settings/About it shows 6.4 GB capacity and 4.8 GB available. Very efficient video coding. Note: It's possible to take a video with the camera upside down, not a good idea. Don't know how I did that since now can't do it again. 31 March 2012 - When you connect the iPod touch to a PC and look in My Computer you will see all the still and video files you have created on the iPod. If the file size is below 100 MB (my best guess) then it's no problem to transfer the file, but above that file size the transfer gets to 100% complete then after some time fails. "The following problem occurred while copying pictures: the I/O operation has been aborted because of either a thread exit or an application request." Senior level Apple support knows about this problem and a solution may be to use some ixxxx application on the iPod to split the video into smaller files that can be moved. Note: If a video is selected on the iPod at the bottom one of the icons is a rectangular box with a right arrow (different than the rectangular box with an up arrow) that is for uploading the file to YouTube. I think the old Youtube starting file size limitations were10 minutes on run time and 100 MB on file size, but in 2009, in order to support HD video, they increased the file size limit to 2,000MB. Maybe Apple did not hear about this? 21 May 2012 - While talking to apple advanced support I learned that there are some issues with WIN XP computers and the Apple A4 chip used in the latest iPhone and iPod. It may be that I need a new computer that's at least a dual core, like the Apple Mini. This is the reason I bought the Apple TV. Once you have the Apple TV connected to your home network and have Home Sharing turned on in iTunes and in the Apple TV you're ready to see fantastic photos in .tif format. The thing that's so great about seeing .tif images is that tif is a container format that allows a host of options that are not available with .jpg images. .jpg images are limited to 8 bits per color channel and sRGB color space whereas .tif supports either 8 or 16 bits per color channel and either sRGB or Apple RGB as well as color profiles. First in iTunes (on up to 5 different computers) under the Advanced tab you turn on Home Sharing and then also under the Advanced tab you Choose Photos to Share. Note: You must have iTuns running in order to use this feature (it's the server program). Note: on the Apple TV you will only see thumbnails i.e. there are no file names displayed, so you need to use folders to separate images that appear the same otherwise (like that use different numbers of bits per color channel or have other differences like color spaces or profiles. Photo Stream will NOT work with WIN XP. 21 May 2012 - When trying to displaying a half dozen of the flower photos from the Ukiah Garden Club show only 2 of 6 displayed the others shows up as a small gray square. While working with Apple support it looked like the two that did display had file sizes that were under 60 MB whereas the photos that didn't display had file sizes over 60 MB. Modifying a file from 300 DPI to 250 DPI reduced it's file size to just over 50 MB and now it displays OK. This software running on a PC (or MAC) allows loading music from your CDs into the iPod, i.e. the functionality of the iPad. It also is the server for displaying any number of media using Home Sharing so must be running to do that. Note: iTunes starts automatically when you connect an Apple handheld device via a USB cable to a computer. One of the "features" of iTunes is that it can synchronize your computer and handheld device. If you have two computers and a pop-up menu askes if you want to sync be very careful how you answer because if you say yes it may erase your handheld device and sync it to the current computer but you may have wanted to retain all the media you you had loaded from another computer. I think this problem is solved by eCloud, but am not sure of the details on how to get that to work. Some apps are stand alone. That's to say that you just need to load the application using the App Store (even if it's a free app) and run it. There is a built-in email app in the iPod touch, but it requires linking to an email account. This is an Apple free text messaging app but it only works between Apple devices running OS5 (or higher?). These should allow communicating with other devices. Unfortunately the descriptive material does not tell you the system requirements. For example I tried Viber, but although I've been able to install it I'm not able to communicate with Mobil phones. I think the other person also needs to have Viber. Skype - this works. It allows making and receiving either audio only or video + audio calls to other people who are running Skype. But you need to pay to be able to make a voice call to someone's phone number (i.e. someone who does not have Skype or you don't know their Skype handle). There are a number of SMS apps, but again it's not clear if they work with a plain cell phone with SMS capability or if they need the same app installed on a smart phone. 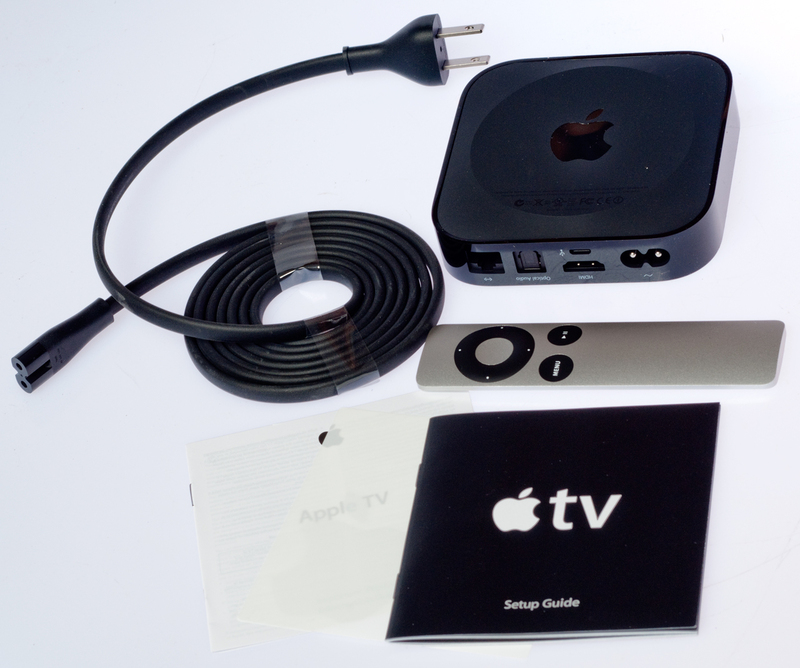 Apple TV - a hardware device that connects to a wireless or wired LAN and has an HDMI output to drive a home theater or HD TV set. iTunes - A software program that runs on a PC or Mac computer and auto starts when an iPod (or other Apple portable device) is connected to a USB port. 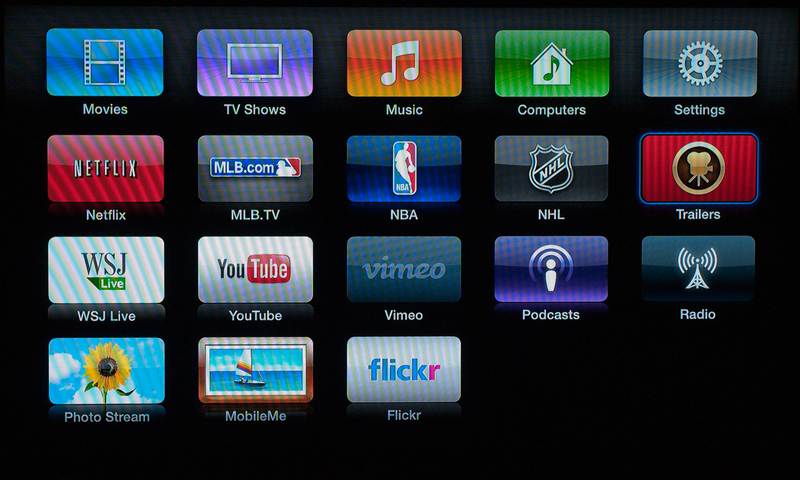 Computer - a built-in feature of Apple TV that includes: Music, Movies, TV Shows, Podcasts, iTunes U and Photos (this is how you can display .jpg and .tif images) which are stored on up to 5 computers. Home Sharing - a built-in feature of Apple TV and iTunes that allows up to 5 computers to feed the Apple TV various media. Works on iPod touch and many iPhones. That means that the milti-pin I/O connector is the same on both of these as is the Operating System. 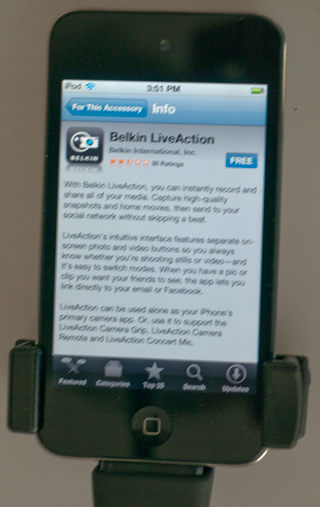 When first installed it prompts you to install the free app Belkin LiveAction. The left are is spring loaded so it can accomodate some variation in case size. app is running. It does NOT work with the Apple Camera app. The photos do not automatically show up in the Photos, app. Instead you need to run LiveAction and transfer them to the Photos app or somewhere else. 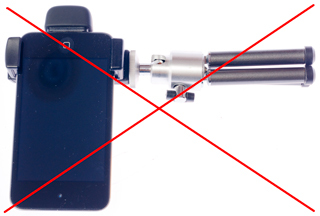 There is a 1/4-20 tripod socket on the bottom of the grip, BUT it will not work with a Mini Tripod because the iPod falls over. There may be a suction cup windshield mount that has a 1/4-20 male tripod thread that would work? 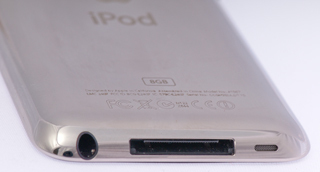 Because the iPod touch is very similar to the iPhone they share many accessories. These are available on eBay from China at very low cost. Tripod Bracket has 1/4-20 threaded socket on bottom. 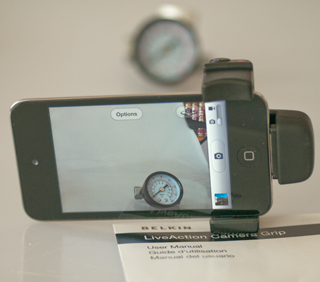 Great for mounting iPod on camera tripod or light stand. AC to USB 5 Volt adapter & USB to iPod (iPhone) cable. Cigarette Lighter Plug to iPhone charging cable. The iPod touch can figure out it's location based on WiFi hot spots and their locations. But it does not have an embedded GPS receiver. 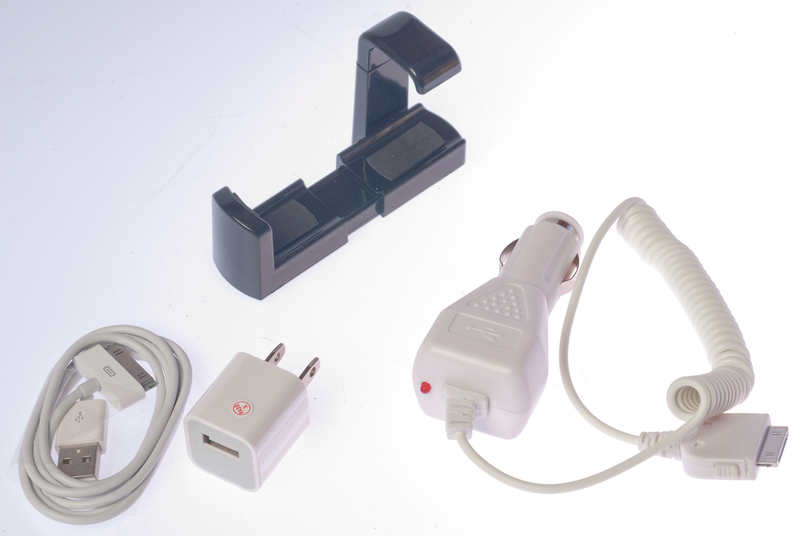 There are after market GPS receivers that can be plugged into the iPod and apps for GPS navigation. When taking talking head videos it would be nice to have more of a telephoto lens. Got this one for a few dollars on eBay, but it's got a couple of problems. The minor problem is that the amount of telephoto effect is very small, nowhere near 2X. The big problem is that in order to attach the lens to the iPod touch you need to use the included ferrous washer and it's double sided tape. That's because the metal iPod case is non magnetic. After carrying the iPod around for a couple of days the washer had moved smearing the sticky stuff over the lens. Also the washer no longer does a good job of holding the lens, i.e. the lens will lean forward and fall off. Note the lens is so close to the corner that the washer has part hanging in the air, making it easy to get pushed in. You can see the goop to the lower right after I pushed the washer back where it started out. page created 23 March 2012.